Looking good is easy when slimming features are built into the garment. 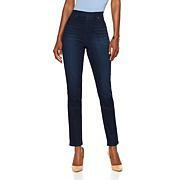 This ponte lean jean has a mesh-lined comfort waistband that visually contours your middle, helping create a curvy silhouette. 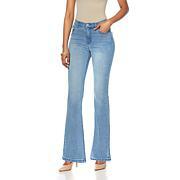 Designed like a skinny jean but with a dressier appearance, these are fabulous for both work and social. Im not a fan of slimwear. The look and fit was great if you dont want to sit down. Fabric was excellent. But, Im in my 60s, I buy DG2 for style and comfort. I dont want to feel like Im wearing a girdle. Her regular comfort waist would have been perfect. Im returning because as nice as they look on, I cant sit down, eat something and be comfortable. Im too old to wear shape wear. No thanks. The material and shape of these pants is nice and I would have kept them but one leg was a whole inch shorter than the other. Very poor workmanship. The leg length should be the easiest quality control to check.